In a recent post I discussed some of the major themes and ideas to emerge from the keynote addresses delivered at the recent Martial Arts Studies held at the University of Cardiff. Astute readers may have noticed that something was missing. Due to the constraints of time I omitted any mention of my own presentation from that first report. Now that a few weeks have passed and I have had a chance to get settled, its time to rectify this omission. This task was made even easier when I received an email from the conference organizer letting me know that a recording of my talk was going to be made available on Youtube. A number of presentations were taped (with permission) and some of the graduate students at Cardiff have been editing and compiling footage so that this can be shared with the public. Rather than simply reading my account of my paper, you can go and watch the original presentation here. The total running time on this video is just over an hour. Special thanks go to Ester Hu and Ning Wu for their hard work in preparing this and the other recordings. I am also happy announce that two of the other keynote addresses have also been uploaded and are made available to viewers. These are the conferences opener by Stephen Chan (“Martial Arts: The Imposture of an Impersonation of an Improvisation of Infidelities (amidst some few residual fidelities”) and D. S. Farrer (“Efficiency and Entertainment in Martial Arts Studies: Anthropological Perspectives”). While by no means exhaustive, I think that together these three presentations do convey a sense of the work being done in this newly emerging interdisciplinary field. Of course not everyone loves video. I for one would always prefer to read a paper. For those of you who share my inclination I am also posting the text of the remarks that I prepared below. Before launching into the substance of this discussion a few words of explanation may be in order. This paper summarizes some of the final arguments made in my forthcoming volume (with Jon Nielson) The Creation of Wing Chun: A Social History of the Southern Chinese Martial Arts (State University of New York Press, 2015). It can almost be thought of as a public reading of the volume’s concluding chapter. Except that it isn’t. The conclusion would have been too long and it presupposes that one has just read the preceding book. So this talk combined discussions from both the books introduction and conclusion, as well as some other material bringing it all together. Still, one might think of this as a “reading” from the upcoming volume. Enjoy! In April of 2011 Hong Kong Airlines did something seemingly out of character. Most airlines seeking a share of the lucrative business class market attempt to impress the public with photos of their genteel and sumptuous cabins. Some seem to be engaged in an arms race to find ever more attractive and demure flight attendants. Instead Hong Kong Airlines announced that their flight crews would be taking mandatory training in a southern Chinese form of hand combat called Wing Chun. Having earned a reputation as a street fighting art on the rooftops of Hong Kong in the 1950s, this move appears paradoxical. It is one thing to quietly train cabin crews in rudimentary self-defense skills. It is quite another to offer press releases, give interviews, and post internet videos of how an unruly customer might be restrained. It would be wrong to suggest that there is no glamour attached to Wing Chun. This was the only martial art that the iconic Bruce Lee ever studied. Nevertheless, when one juxtaposes the image of a bloody Lee (straight from the promotional material for Enter the Dragon) with a petite flight attendant from any competitor’s television commercial, one must ask what the advertising executives of Hong Kong Airlines know about their regional markets that we do not. On purely historical grounds, it is rather odd that anyone seeking the past should “remember” Wing Chun, or any other traditional martial art, at all. The blunt truth is that for most of China’s history, the martial arts have not been very popular. While there has always been a subset of people who took up these pursuits, they were something that the better elements of society studiously avoided. In the mid-1950s, when Bruce Lee was learning Wing Chun from his teacher Ip Man, there were probably less than a 1000 practitioners of the art in all of Hong Kong. When Ip Man learned the style from his teacher (or Sifu) in Foshan at the turn of the 20th century, it seems likely that there were less than two dozen students of his version of the art in total. The first realization that we need to wrap our minds around is that in many ways studying the “traditional” Chinese martial arts is actually a quintessentially modern activity. Given this disconnect, much of my research over the last couple of years has sought to understand how exactly these arts have come to be such effective symbols of local identity and continuity with the past in southern China. But in today’s address I would instead like to shift my focus slightly and ask why some arts, like Wing Chun, have succeeded in the global system while others slipped quietly into obscurity. What does this success indicate about the nature of the martial arts in general? And what does it suggest about the challenges that individuals perceive in the face of rapid economic, social and cultural dislocation? The techniques of the traditional Chinese martial arts have a history that stretches back hundreds if not thousands of years. Yet the story of Ip Man, Bruce Lee, and the success of Wing Chun nicely illustrates the degree to which these arts have succeeded precisely because they are modern and global practices. Of course this is not how we generally think about or discuss the “traditional” martial arts. 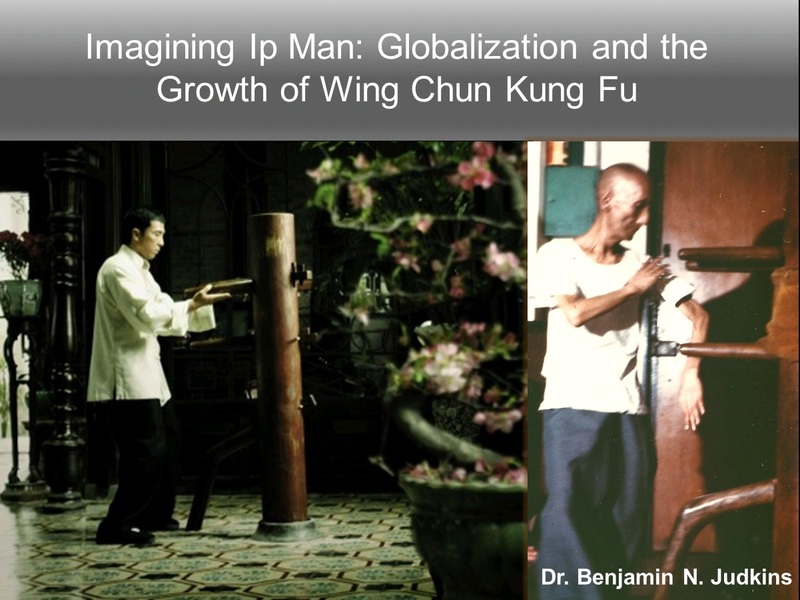 While Ip Man and his student Bruce Lee are headlining today’s address, in many ways it is “globalization” that actually provides the terrain that we will explore. Originally rooted in the birth of European modernity this system of rapid social, economic and cultural change has since expanded to mark every corner of the globe. Like much of the world China was first touched by globalization during the rush to construct a free trade system based on open markets during the 19th century. One simply cannot dismiss the influence of larger systemic forces when thinking about critical events in recent Chinese history like the Taiping Rebellion, the growth of regional imperialism or the Opium Wars. It is also fascinating to note that so many of the martial arts that are popular today, including practices like Taijiquan or Wing Chun, were actually either created or reformulated and disseminated during this late period. Authors like Douglas Wile have suggested some reasons as to why this should not be a surprise. And then we see these same practices explode onto the global scene in during the 1960s-1970s as globalization hit another peak. Yet just as the martial arts are a complex subject that must be examined from multiple perspectives, there is more than one way of thinking about the challenges posed by globalization. A more conventional, empirically driven, reading of the phenomenon claims that globalization is present when we see three things: the increased flow of goods (meaning trade), capital (or money) and labor (people) crossing state boundaries. This rather simple conceptualization of globalization is the sort of thing that I was introduced to in my graduate economics training. It’s a very materialist approach to the problem. But it does direct our attention to some factors that are absolutely critical in understanding the challenges that an art like Wing Chun faced as it has sought to expand its presence throughout international markets. Yet this isn’t the only way to think about globalization or the obstacles and opportunities that it has presented the Asian martial arts. Peter Beyer, in his work on the survival and evolution of religion in a modern era, suggests that we can also conceptualize globalization as the increased flow of ideas or “modes of communication” between previously isolated communities. Beyer goes on to note that this sort of transformation can have important implications for any social institution responsible for transmitting fundamental social values, and during the late 19th and early 20th century, that is exactly how the Chinese martial arts came to be understood. Modernization theorists long suspected that traditional types of identity such as ethnicity and religion would vanish in the modern era, and for the most part China’s May 4th intellectuals agreed. They also claimed that the traditional martial arts with their feudal and backwards values could not survive in the current era. Needless to say this hasn’t actually happened. Regional identity is strong, religions still exist in the world today, and more people are currently practicing Wing Chun than at any other time in its past. So how do practices survive in a hanged world? By evolving. More specifically, while rapid modernization may resolve one set of dilemmas, it often creates a whole host of secondary problems. This presents the guardians of more traditional ways of defining social meaning with an opportunity. On the one hand they can either find a new problem to offer a solution for, in essence turn themselves into a purveyor of a specialized skill and conform to the demands of modernization. Or they can double down on the more basic question of identity and meaning in a world where these things have become somewhat scarce commodities. But the critical thing to realize is that both of these strategies represent a transformation to accommodate modernity, even if one continues to market your brand based on its long history. This is where the debates about Ip Man, who he was, what he taught, what sort of art Wing Chun really is, enters the picture. As we look at discussions within the Wing Chun community and other traditions we see exactly this discussion taking place. Do the martial arts need to evolve in order to survive, or does their value come from the timeless message of who we really are? Note also that this dynamic can help us to make sense of the powerful drive to find the supposedly “ancient” and “authentic” roots of these practices that currently dominates so many discussions of the martial arts including, once again, Wing Chun. Ip Man did much to increase Wing Chun’s profile as a regional martial art after 1949 and he set the stage for its eventual rise to prominence within the larger hand combat community. Still, one cannot understand the global growth of this system, or any of the Asian fighting arts, without appreciating the role of his better known student, Bruce Lee. Lee is the axiomatic figure in any discussion of the late 20th century internationalization of the martial arts. While some individuals in both North America and Europe had been exposed to these systems during the tumultuous middle decades of the 20th century, often as a result of military service in the Second World War, the Korean War or Vietnam, the appeal of the traditional Asian hand combat systems had remained limited. These limitations manifest themselves in different ways. Fewer individuals in the west practiced these arts in the 1950s and 1960s than is the case today. Nor did they enjoy the almost constant exposure in the popular media that we have become accustomed to. A survey of the pages of Black Belt magazine, then the largest American periodical dedicated to the martial arts, shows that most of the articles published in the early to middle years of the 1960s focused on Japanese hand combat systems. Karate and Aikido were probably the best known alternatives to Judo. Indeed, much ink was spilled during the decade debating the relative merits of these different systems. Bruce Lee’s initial appearances on television, where he played the role of Kato on the Green Hornet (1966-1967), and then on the big screen in the 1973 sensation Enter the Dragon, had a profound effect on the place of the Asian martial arts in western popular culture. Given their current popularity we often forget that prior to the 1970s very few individuals were familiar with the term “kung fu” or even knew that the Chinese had also produced hand combat systems of their own. Bruce Lee’s appearance on the Green Hornet had an immediate impact on the North American martial arts community. What was not evident at the time was that the boundaries of this still relatively small community were about to be fundamentally redrawn. 1973 saw the release of both Enter the Dragon and the news of Lee’s death at the shockingly young age of 32. The film captivated western audiences with its innovative fight choreography, nods to Asian philosophy (something else which had been growing in popularity with western consumers since WWII) and unabashed violence. Concerned that the public might not identify with a single leading Asian actor, the film featured a diverse cast which gave important roles to both John Saxon and Jim Kelly. These fears proved to be unfounded as audiences around the globe were drawn to Lee’s charismatic performance. Still, the self-conscious decision to feature an ensemble cast of martial artists from a variety of racial, national, economic and social backgrounds had a powerful impact on viewers. It broadcast once and for all that the potential for both self-realization and group empowerment promised by the martial arts lay within every human being regardless of their personal circumstances or nation of origin. Lee’s untimely death in 1973 crystallized his image at a single moment in time. He became a prophet to his followers, snatched away at the very moment of revelation. Rather than looking forward to what Lee would have done next, those who struggled to understand the promise of this message were instead forced to look back to his previous films, television appearances, interviews and assorted writings. All of these things could be easily commoditized. Martial arts instruction could also be commoditized and distributed to the public. The wave of enthusiasm unleashed by Lee’s sudden eruption into the popular consciousness filled martial arts classes of seemingly every style with new students. As one might expect, the previously obscure Chinese martial arts were major beneficiaries of this new attention. Wing Chun’s development was forever shaped by its association with Bruce Lee. While Lee had been involved with the film industry since his youth (when he starred in a number of movies as a child actor), he was also a dedicated martial artist. Lee had first been introduced to Wing Chun in Hong Kong in the 1950s when he became a student of Ip Man. After coming to the United States he continued to teach and promote the Chinese martial arts. His skills, personable nature and TV roles led to appearances in Black Belt magazine where he mentioned his background in Wing Chun and his teacher. Multiple articles published in this period actually featured images of Ip Man sitting beside, or practicing chi sao with, his increasingly famous student. Given how little western media exposure the Chinese arts as a whole received, this was an unprecedented amount of publicity. Even before the advent of the “Kung Fu Craze” in 1973, Bruce Lee had assured that his Sifu would be among the best known Chinese martial artists in the west. 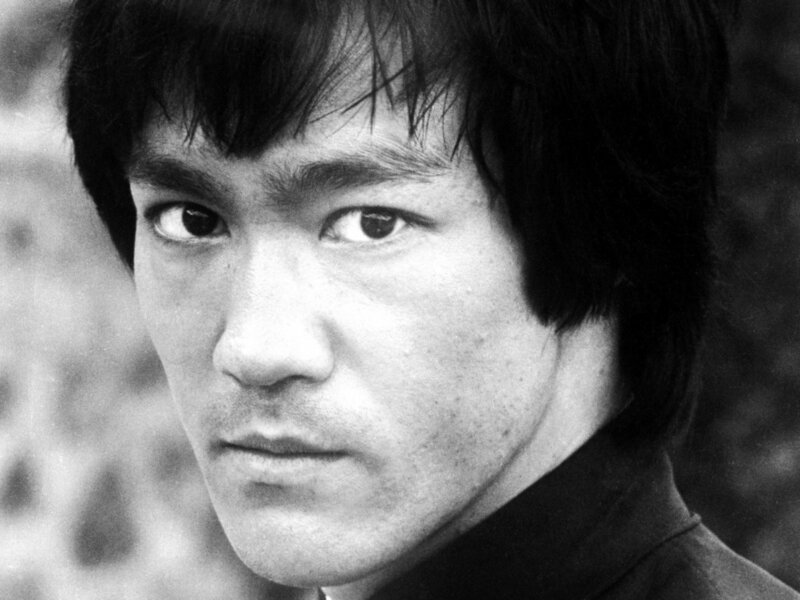 The Bruce Lee phenomenon boosted the ranks of many different Asian martial arts styles. In truth Karate schools, because of their popularity, probably benefited more from his appearance than anyone else. Yet this transformation in the way that the global public perceived these fighting systems was not enough to preserve every fighting style that had been practiced earlier in the 20th century. At the same time that arts like Wing Chun, Taijiquan and the various schools of Karate were reaping the benefits of this unexpected windfall, other traditional Chinese systems were slipping into obscurity. What are some of the other more material factors that may have facilitated Wing Chun’s spread throughout the international system? The first, and possibly most critical variable to consider, is geography. Exporting any good, whether physical or cultural, is expensive. All forms of trade are ultimately limited by the size of the “transaction costs” associated with the exchange. These costs include factors such as the expenses of adapting, translating and shipping goods for sale in other markets. Ip Man’s flight to Hong Kong late in 1949 was, without a doubt, the single most important factor in explaining the subsequent success of his art. Why? This city occupied a unique place in the post-WWII economic order. It had traditionally been a major transit port for trade between western markets and China. As a result residents of Hong Kong were connected to global markets in ways that most individuals on the mainland were not. These links were manifest in many areas, all of which served to reduce Wing Chun’s transaction costs. Hong Kong itself was one of the most urban and modernized sections of southern China. It had a highly efficient educational system which actually produced more students than the local universities could absorb. Some of these individuals were fluent in English and had either family or business connections abroad. In fact, a number of Ip Man’s younger students in the 1950s and 1960s came from relatively affluent middle class families and traveled to North America, Europe or Australia to pursue additional educational opportunities. Ip Ching, the son of Ip Man, has noted that this pattern of out-migration was one of the main ways in which the socioeconomic status of his father’s students contributed to the spread of the Wing Chun system. When the Bruce Lee phenomenon hit in the early 1970s, there were already a number of individuals studying and working in various western cities who were able to take on students and begin to teach the Wing Chun system. More soon followed. The transnational flow of labor, in this case students and young adults, was critical to Wing Chun’s eventual success. Other arts, even ones that had been very popular, had fewer opportunities to take advantage of this outpouring of enthusiasm if they were located in areas less connected to the global transfer of capital, ideas and individuals. The various martial systems of south-west China struggled to gain a foothold within the global market as comparatively few individuals from this region had emigrated to the west prior to the 1970s. Likewise, not all of Hong Kong’s arts were blessed with a relatively affluent group of students who had access to international employment and educational opportunities. It is also important to consider the general attitude of these students and how that may have interacted with their socio-economic status. It seems to me that in the current era there seems to be a push to reimagine the Wing Chun of the 1960s as something more “traditional” than it actually was. This can be seen in a number of areas, from the re-emergence of the “discipleship” system in a number of schools to the enthusiasm with which some students have greeted the rediscovery of “lost lineages” claiming direct descent from either the Shaolin Temple or late Qing revolutionary groups. While discussing the Wu Taijiquan community from Shanghai Adam Frank has argued that the shifting economic opportunities presented by global expansion will not always lead to more openness within a fighting style. At times the pressures and potential profits of international markets may actually lead to a renewed emphasis on secrecy and exclusion as organizations attempt to differentiate their product and control the flow of financially valuable teaching opportunities. We should not assume that the process of globalization will necessarily lead to more open or liberal styles. So how did Wing Chun, and its various students, appear to observers prior to the explosion of interest that would make it a leading Chinese art? Did it give the impression of a forward looking system, or one that was basically reactionary, seeking to preserve tradition? In 1969 a Wing Chun student named Rolf Clausnitzer and his teacher Greco Wong published a book titled Wing-Chun Kung-Fu: Chinese Self-Defence Methods. Clausnitzer had lived in Hong Kong as a youth and was one of the first westerners to practice and closely observe the Wing Chun system. He had initially interviewed Ip Man in 1960 and later studied with his student Wong Shun Leung. After moving to the UK he continued his studies with Greco Wong, who was a student of Moy Yat. Readers should carefully consider the timing of this publication. In 1969 the general explosion of interest in the martial arts (and Wing Chun in particular) that would be unleashed with Enter the Dragon was still a few years off. So this early work offers us a suggestion of how Ip Man’s Wing Chun system might have appeared to western martial artists prior to the launch of the “Kung Fu Craze” and the orientalist urges that it seems to have embodied. Originally from Kwangtung province he migrated to Hong Kong where he still resides. An outspoken man, Yip Man regards Wing Chun as a modern form of Kung Fu, i.e. as a style of boxing highly relevant to modern fighting conditions. Although not decrying the undoubted abilities of gifted individuals in other systems he nevertheless feels that many of their techniques are beyond the capabilities of ordinary students. Their very complexity requires years if not decades to master and hence greatly reduced their practical value in the context of our fast-moving society where time is such a vital factor. Wing Chun on the other hand is an art of which an effective working knowledge can be picked up in a much shorter time than is possible in other systems. It is highly realistic, highly logical and economical, and able to hold its own against any other style or system of unarmed combat. 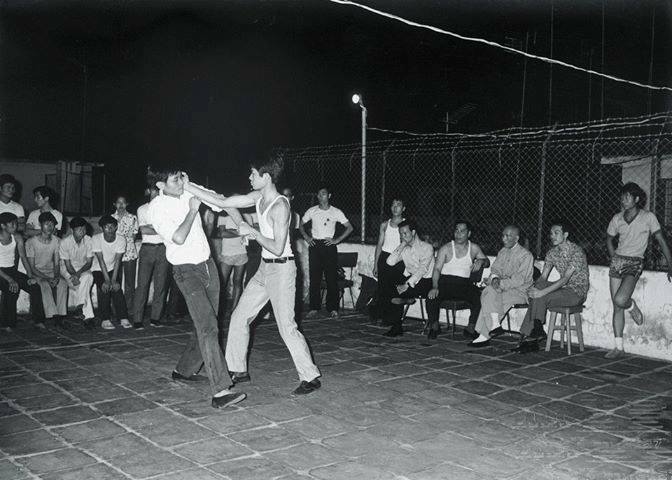 Even more thought-provoking is Clausnitzer and Wong’s description of Ip Man’s students and how they compared to other groups in Hong Kong’s hand combat marketplace. An interesting characteristic common to most practitioners of Wing Chun lies in their relatively liberal attitude to the question of teaching the art to foreigners. They are still very selective when it comes to accepting individual students, but compared with the traditional Kung Fu men they are remarkably open and frank about the art. If any one Chinese style of boxing is destined to become the first to gain popularity among foreigners, more likely than not it will be Wing Chun. Bruce Lee’s rise to superstardom ushered Wing Chun onto a wider stage than Clausnitzer and Wong could have imagined in 1969. Yet, as we have seen, the system did possess certain characteristics that allowed it to capitalize on this windfall during a time when other traditional Chinese styles were falling into obscurity. Perhaps the most important of these were Ip Man’s decision to streamline the art following his move to Hong Kong and the nature of the students that his school attracted. Clausnitzer and Wong’s early observations appear almost prophetic in light of the system’s subsequent emergence as one of the most popular fighting arts within the global arena. Ip Man visiting Ho Kam Ming’s School in Macau. Some accounts (such as those left by Chu Shong Tin) suggest that Ip Man liked to play the role of the Confucian gentleman. This embodiment of traditional cultural values attracted a certain type of student during the Hong Kong period. Yet, as the previous quotes remind us, Wing Chun succeeded in large part because Ip Man understood it as a modern fighting system. Even Lee’s films, while examples of visual fantasy, retained a veneer of gritty social reality. His protagonists stood up to racial, social, national and economic oppression in an era when those problems were acutely felt. And Lee’s fame has done much to facilitate the subsequent success of Ip Man as a media figure. Still, the Ip Man that seems to be the most popular with audiences today is a different sort of hero than his later student. Whereas Bruce Lee’s early films appeared to carry a politically radical subtext, Ip Man as he is imagined on-screen has been a much more conservative figure. Portrayed as a local and national hero, he fights to retain the values and hierarchies of the past rather than to overturn them. There are a number of ways to approach this disjoint. When reimagining Ip Man for the big screen it is no longer enough to see him only as a local kung fu teacher. For these movies to be a commercial success they had to be embraced by wide audiences in both Hong Kong, on the mainland and in the west. 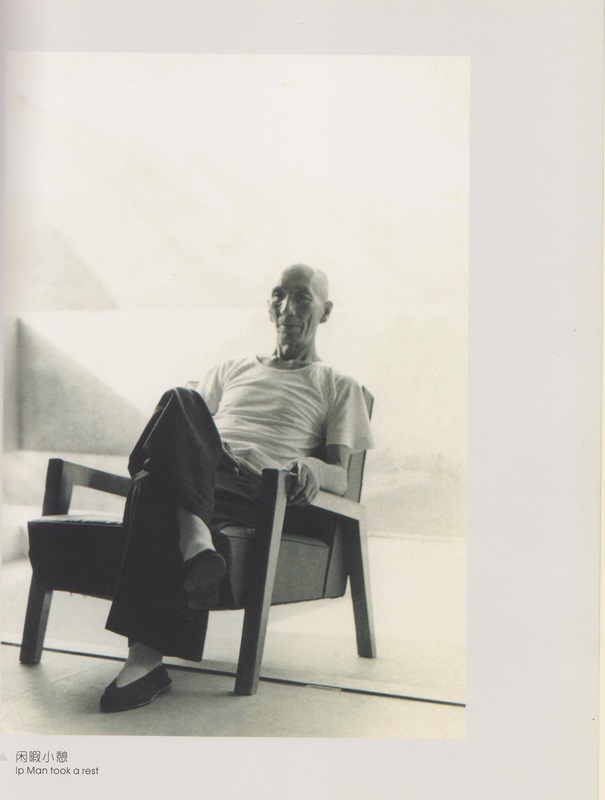 As such a dual discourse was adopted where Ip Man found expression as both a local and a national figure. Wilson Ip’s 2008 effort succeeded precisely because it managed to strike a masterful balance between these various audiences. So what is the significance of the current reimagining of Ip Man’s legacy for those of us in martial arts studies? Peter Beyer might remind us that there is more than one way to think about the process of globalization. While ultimately a continuation of the drive towards modernity that was launched in 19th century Europe, we can also understand it as a transformation of the ways in which meaning is communicated between society and individuals. This more conceptual understanding of globalization may shine a different light on the sorts of roles that the martial arts, and Wing Chun in particular, are being called on to perform in the current era. According to Beyer, the process of globalization has resulted in traditional means of value creation being displaced by schools of thought that privilege efficiency and professionalism. Religious modes of communication have been one of the great losers in this process. Indeed, Beyer’s work is centrally concerned with the fate of organized religion in an increasingly global world. Given that the imminent defines the totality of our daily existence, we actually have trouble talking about it as we have no exterior points of reference from which to define abstract values and concepts. This problem is overcome by postulating the existence of a “transcendent” state in which none of the basic conditions that define daily life are said to exist. Through their monopoly on socially meaningful communication, religions (and other ritual systems) were traditionally able to make themselves essential in all sorts of social spheres. This balance was upset by the rise of more professionalized modes of action during the modern era. Why? Highly focused types of communication are more efficient than those based on general cultural ideas. Modern societies value this increase in efficiency. As a result the priests and nuns that had overseen so many elements of western life were replaced with doctors, nurses, teachers, counselors, lawyers and bureaucrats. This same process of increased specialization and professionalization has now found expression all over the globe. Nor are religious institutions the only ones to be challenged by these fundamental shifts in social values. Any “generalist” mode of communication can potentially find its social influence threatened by the rise of professionalism and increased rationalization. In fact, when individuals talk about the declining popularity of many martial arts in mainland China today, it is often this sort of narrative that they turn to. The traditional martial arts are seen as incompatible with the demands of modernity. This is a very brief summary of Beyer’s complex argument as presented in his volume Religion and Globalization (2000). Yet contrary to the expectations of the early modernization and secularization theorists, religion, ethnicity and the like has not simply vanished. Instead the disruptions created by globalization have presented new opportunities for these institutions to retain some degree of social relevance. On the one hand, they can focus on new aspects of “public performance” by addressing the secondary problems caused by this massive economic and social transformation. This more liberal strategy proved to be popular and can be seen in places as diverse as the rise of “liberation theology” in Latin American or the increased concern with environmental protection by a number of different types of churches in the more affluent west. Other organizations have instead adopted a more conservative approach by refocusing their energies on the question of “fundamental communication” about the transcendent. This second strategy is especially useful if one wishes to address questions of identity, and hence the definition and boundaries of the community, in the face of increased global pressures and dislocation. Such approaches have proved to be popular and their influence can be seen in the rise of fundamentalist communities in many world religions. Nor is there any reason to think that these two adaptive strategies are restricted to discussions of religion. Douglas Wile has noted that the disruptions which imperiled the Chinese empire in the middle of the 19th century (including the Taiping Rebellion and the Opium Wars) badly shook society’s self-confidence. This, in turn, became a critical moment in the formation of modern Taijiquan. He argues that the Wu brother’s subsequent research and development of the Taiji Classics can be understood as an attempt to find, reevaluate and reassemble what was valuable in Chinese culture in the face of a rapidly evolving existential challenge from the modern west. While Taijiquan clearly has technical roots which stretch back for centuries, it is this late 19th century social agenda, expanded and reimagined in explicitly nationalist terms during the 20th century, which defines how many people experience the system today. Still, there are debates as to what Taiji should become. On the one hand there are groups who see in the art a cultural repository of what is essentially “Chinese.” While foreign students might learn the techniques, it is doubtful that they could even gain the deep cultural knowledge necessary to correlate and perfect this mass of material. For some practitioners what lies at the root of the system is an essentialist ideal of racial or national identity. Other reformers have claimed that for Taiji to survive in the modern world it must adapt. Specifically, it must evolve to meet the needs of its changing student. An aging population can benefit from the increased feelings of health, balance and well-being that come with daily forms practice. Busy corporate executives can turn to simplified versions of the art for stress relief and lifestyle advice. I think that the idea of Sifu as life coach is something that many of us are probably familiar with. Here we see the two adaptive strategies that Beyer suggested were open to all traditional modes of communication threatened by globalization. The first camp has focused on the question of primary communication, which in the modern era so often finds its expression in the exploration of cultural and national identity. The second group has instead sought to adapt the art to deal with the ancillary problems created by life in an increasingly fast paced and interconnected modern society. This same process can also be seen in the Wing Chun community. Certain schools continue to focus on the “solutions” (be they self-defense, health or psychological well-being) that Wing Chun can provide. Yet not every discussion of the art trends in this utilitarian direction. The endless debates of the deep (and basically unknowable) origins of this style signal an ongoing interest in the idea that a hidden and somehow more “real” identity is out there. It is interesting to note how often that search leads back to nationally motivated myths of resistance grounded in either the Shaolin Temple or legendary rebel groups. Indeed, the impulse to see Ip Man as something more than a martial arts teacher is not confined to recent films. It also reflects a fundamental current within the Wing Chun community. What defines the heart of this system, and what should it become in the future? Is this a style built around the solutions to pressing technical and social problems? Or is it instead one that attempts to imagine a space in which its members have a better, and more empowered, understanding of who they are? This scene is fascinating as it seems to contemplate the rise of Ip Man as a cultural icon and then goes on to address this debate in almost explicit terms. What is the value of the Southern Chinese martial arts? Are they an expression of local identity? Are they subservient to nationalist dreams? Or do they somehow transcend this? Can they become more? Nor, if Beyer is correct, should we expect to see this debate resolved in the near future. A dispute between positions representing such fundamentally different sets of possibilities simply cannot be resolved. The dialectic tension between these two competing visions generates much of the emotional power that drives the Chinese martial arts today. While these fighting systems may appear to be “traditional,” in their present form they are inescapably the product of a modern global world. Ip Man’s actual genius lay in his perception and embrace of this fundamental truth. If you enjoyed this presentation you might also want to see the Keynote addresses by Stephen Chan (“Martial Arts: The Imposture of an Impersonation of an Improvisation of Infidelities (amidst some few residual fidelities”) and D. S. Farrer (“Efficiency and Entertainment in Martial Arts Studies: Anthropological Perspectives”), which have also been uploaded to Youtube! Perhaps we mean to contrast “immanent” with transcendant, rather than “imminent”? Thank you, I’ve learned a lot of things about martial arts because of this blog. Thank you for sharing I’ve enjoyed reading your article.